Parkinson’s disease, a progressive disorder of the nervous system, may develop gradually and can vary in intensity from person to person. Since symptoms can be different from one individual to the next, it is important for in-home caregivers to be aware of the early signs of Parkinson’s disease. Care providers who use ClearCare’s home care system and home care software have the advantage of accessing detailed information regarding Parkinson’s anytime it is needed. Originally referred to as “the shaking palsy,” Parkinson’s disease is a neurological condition that affects movement. In a normal brain, nerve cells produce dopamine, a chemical which transmits signals to produce smooth movement of muscles. In Parkinson’s patients, 80 percent or more of these dopamine-producing cells are dead or damaged - causing the nerve cells to fire wildly, resulting in erratic movements and uncontrollable tremors. According to the Parkinson’s Disease Foundation, as many as one million Americans have Parkinson’s, and approximately 10 million suffer worldwide. Fortunately, thanks to dedicated caregivers and the home care system and home care software provided by ClearCare, more Parkinson’s patients are able to live comfortably at home. Although full-blown Parkinson’s can be disabling, the initial symptoms may be so subtle that patients sometimes simply ignore them or associate them with the effects of aging. 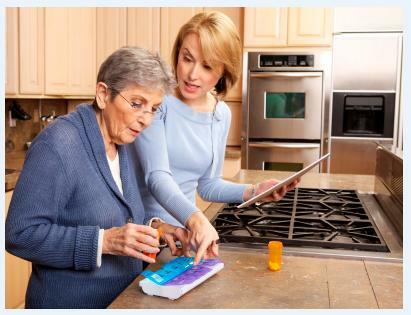 Qualified caregivers using a remarkable home care system and home care software, like ClearCare, can track the progression of symptoms, alert family members to concerning behavior and keep doctors informed of the patient’s condition. When caregivers notice their clients moving more slowly or having trouble with balance and coordination, they can note the behavior in ClearCare’s home care software. This information is then available for physicians, agency administrators, and family members so that everyone is on the same page. A home care system also makes it easy to manage medications and doctor appointments. Since Parkinson’s symptoms tend to worsen with time, an organized home care system becomes an invaluable tool for caregivers, clients, and their families. ClearCare’s home care system and home care software are designed to be as useful as possible for caregivers and their clients - including those that suffer from Parkinson’s disease.